I received an e-mail from my eldest brother Mike last week, lamenting the state of holiday beers. As this is the season for rich, hearty ales, he thought they'd all be largely of the same quality, but found several so bad that he condemned them to the sink drain, saying they tasted like "bitter ginger ale mixed with beer. Really nasty." He then suggested I do a blind taste test on various seasonal holiday beers. Something that surprised me was that this year we saw a number of lighter, refreshing beers, rather than heavy, malty monsters with ABV's of 10% or more, even by breweries like Dogfish and Weyerbacher. One beer that got a lot of attention was the tart and crisp Traverse City Cherry Wheat by Atwater Brewery. Matt and I were sure it was some sort of shandy, mixing apple cider or another fruit cider with beer for a very subtle, natural fruit flavor. Although it was not our favorite seasonal beer of the night, I'll definitely keep my eye on Atwater Brewery from now on. For me, the highlight of the night was Magic Hat's Snow Roller, which I thought might have been some sort of variant on the American Brown Ale style of brewing. I don't usually drink Magic Hat beers, and never seek them out, but the nicely balanced hop flavor and malty backbone will make me reconsider the brand in future purchases. Hoppier than an English brown ale, this is a beer I'd welcome any time of year. I also loved Sierra Nevada's Fresh Hop IPA, although the IPA is my go-to beer, making this an easy favorite. Tasting just for seasonal beers, I went with Ol' Red Cease & Desist Wee Heavy Ale, which had a robust body and long, sweet and malty finish. I actually thought it was a Belgian beer on my initial tastings. On the negative, DuClaw was the worst offender for me, tasting like artificial flavoring that would make FourLoco seem like a better alternative. Matt's seasonal favorites were the Weyerbacher Winter Ale and Captain Pumpkin's Maple Mistress Imperial Pumpkin Ale. 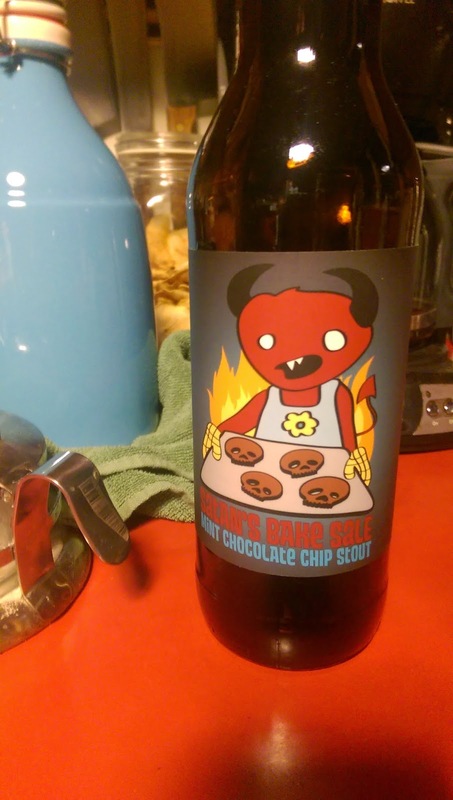 The real surprise came the next day, when we opened a 22oz bottle of Satan's Bake Sale Mint Chocolate Chip Stout by Spring House Brewing. It tastes like drinking a stout and eating a fresh-from-the-oven package of Girl Scout's Thin Mint Cookies. It's smooth, rich, and exceptionally balanced for what sounds like a bizarre beer flavor attached to a wacky name. Well, they weren't all terrible! Fathead's Christmas Ale was fantastic. And I also enjoyed the Bells' Christmas Ale and Great Lakes Brewing Christmas Ale. I won't name the stinkers, but there were some that were pretty bad. It has been a long time since I poured a beer down the drain, but these had to go. I've actually never head Fatheads, but have been looking for it! I did want to get Great Lakes Christmas Ale, as it's been so good in the past, but it was all sold out at the store.